Mama C discovers evidence of black farmers in Maine in 1993! I found this at the Salvation Army thrift store yesterday. I live in Maine. I might have to make a shelf to put it on, because it makes me that happy. Of course that would contradict the point of actually purchasing it. 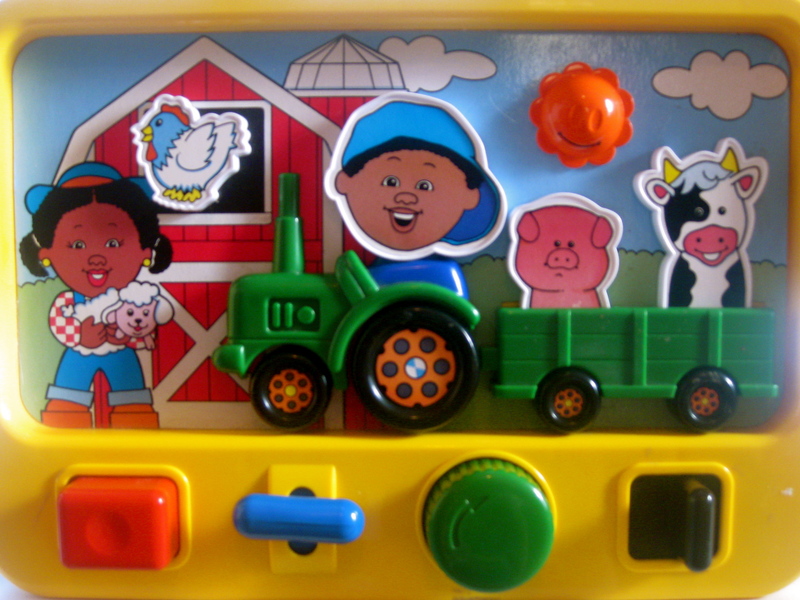 You know to let children play with it, and see a black farm of sorts. I love the baseball cap. Her hair shows that the characters are not just white farmers painted brown. One of our favorite books at the moment is; Summer Sun Risin’ by W. Nilo-Lisa and illustrated by Don Tate, which is an explicit celebration of African-American farmers. Finding this toy in a second-hand shop was like finding a bottle with a note on it on a deserted island. Inside the bottle the message tells me; you are not alone. I know that I am preaching to the choir here, but finding a toy that reflects my sons’ background is rare. Books are easy, so many books reflect what that statistics show; by the time Sam and Marcel are in their forties white will be the minority. I can leave the library with thirty books written by, and about people of color in less than ten minutes now. Finding a toy that represents a human figure is not so easy. Later this morning we are planning our first visit to the local African-American AME church. We are church shopping. Toys and books are not enough. The few friends of color that we have are not enough. The five or so big bang multicultural events we can buy tickets to are not enough. Finding a black farmer from 1993 is not going to give Sam and Marcel the information they need to know what it means to be a black man, a man of color. It is not even a start. Realizing it is not even a start is more to the point. Before this morphs anymore into another post, I’ll leave you with this latest article on the subject; New Research on multiracial adoption questions current practices . Grammy and Grampy will be here soon. They are in town from New Mexico. Time to start the pancakes, and a pot of coffee. I would love to hear how your visit to the AME church goes. We have a 15 mos old biracial daughter. I have contemplated visiting the AME church or another predominantly black church in our area but since I have a hard time with organized religion in general, I haven’t done it yet. Stay tuned! I am almost ready to post about our day at church… Hopefully tonight. Thanks for asking! When the Divine makes itself known: Or how going to church and a near death experience hours later feel related.